Features are easily comparable across brands and make you susceptible to competitors. Which is why most successful B2B companies sell their buyers on perceived value long before features are mentioned. Knowing what your buyer needs through research and connecting the value of your product to that need, will lift conversion rates and increase sales. A value proposition isn’t just the product and services you agree to deliver to the customer, it’s the unique identifier of your business that solves a need your competitors can’t. It goes deep into the problems you want to solve for your market, is often sentimental or philosophical, and defines why you are the right one for the job. According to Hubspot, 95% of buyers choose a solution provider that offers them ample content to navigate through the buying stages. Companies today must target leads early in the sales process as a thought leader providing informational content and actively attracting leads. The buyer’s journey or sales funnel consists of the different stages a customer goes through leading up to their purchase. Below are the three stages of the buyer’s journey and the types of relevant content to use as fuel to move them along to a purchase. Awareness Stage – Prospect is looking for information and answers relating to a problem that points back to a product or service need. Farmers Insurance, for example, launched its 15 Seconds of Smart campaign: short, 15-second videos educating their audience on insurance opportunities. The content was entertaining, educational and sharable all at once. Consideration Stage – You have captured the prospects attention – they know they have a problem that must be solved, and now are trying to discover the best solution. EYStudios, for example, an ecommerce web design and development studio, regularly holds live webinars that include interactive commentary, user-submitted questions, and episodes that often feature expert contributors. Their interactive content targets those already tuned into the brand who are likely looking to make a change with their ecommerce site, or who may be gearing up for a launch. Decision Stage – Prospect has decided to make an actual purchase but still needs to decide from where. These are bottom of the funnel leads that need a final push with a compelling call to action, content, or the right offer. Amazon knows the power of a free trial – and that a great way to get the people who made a purchase is to give them a free trial for Prime Amazon. The Prime service includes everything from live streaming to free digital book downloads and free Prime shipping. This is hard to give up once the trial is over. A consistent content marketing presence will have a great impact on your customer relationships and lift in your overall conversions. CRM systems solve many challenges presented by growth. They can effectively organize contact, company and sales opportunity information as well as every interaction that takes place in the many customer communication channels. It’s critical for marketing and sales teams to function as a cohesive unit, and CRMs are the perfect solution to help scaling organizations achieve that goal and improve productivity. According to Hubspot, 27% of salespeople without the use of a CRM are spending an hour or more a day on data entry. Another important solution that CRMs provide are complex workflows that put lead nurturing on autopilot with email drip campaigns. Automating your communications enables you to move prospects down the funnel more efficiently, generate more qualified leads and ultimately lift conversions. Video has become an important marketing tool on every platform and channel. In fact, 54% of consumers want to see more video content from a brand or business that they support. Videos have effectively dominated the social channels and if you are not creating them you’re likely falling behind. Sometimes it is just a simple, raw approach that works with the right audience and subject matter. For example, The GRI Marketing Group created a 1:1 personalized email for follow-up to leads and saw a 40% lift in engagement. View it here. You can also tell a powerful story with video. Recently, glass company Corning released a video on YouTube – A Day Made of Glass…Made Possible by Corning that has had well over 10 million views. It brought a simple product to life in a new and hopeful way. The video doesn’t demonstrate what glass does; instead it shows what glass could do and how it could impact lives. by communicating with a user through a messaging app, website or some conversational interface. The bot will lead you through a series of dependent questions to collect the necessary information, understand your intent, and deliver the solution or content. It’s all a part of a larger shift we’re seeing in consumer behavior. As people research, they want the information they need as quickly as possible and are increasingly turning to voice search as the technology advances. Email inboxes have become more and more cluttered, so buyers have moved to social media to follow the brands they really care about. Ultimately, they now have the control – the ability to opt out, block, and unfollow any brand that betrays their trust. But, if you’re able to provide actual value in the places they already spend their time, everything changes. All any buyer wants is the most direct line between their problem and a solution. 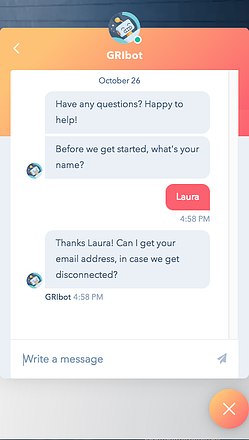 With the aid of messaging apps, bots help consumers find solutions no matter where they are or what device they use – no forms, cluttered inboxes, or wasted minutes spent searching and scrolling through content. To beat your competition in a rapidly changing race for market share, you need to out think and outsmart them by utilizing the latest marketing technologies to deliver relevant and timely value-based communications. If you are looking for a growth agency to help you leap ahead of your competition, please contact Brian Snider at The GRI Marketing Group for a FREE assessment. Brian Snider at 203.261.3337 x 111 or bsnider@gridirect.com. In "digital marketing" , "marketing technology"